Did a large catfish attack a teenager in a German lake? Did a school of piranha eat flesh down to the bone of a busload of passengers that crashed in an Amazonian river? Over the ages, yarns have been spun that fish have actually preyed on man. These legends have found their way into literature, tales, folklore and now television. In a new seven-part series from Animal Planet debuting on Sunday, April 5, 2009 at 10 PM (ET/PT) called RIVER MONSTERS, host, biologist and extreme angler Jeremy Wade travels worldwide to solve these freshwater mysteries, to debunk these myths and to track down these harrowing tales. Wade has made his life’s passion and career searching for a variety of aquatic vertebrae while navigating the globe’s waterways. Each Sunday, he’ll come face-to-face with fear and try to understand these mysterious predators with a taste for human flesh, putting his life on the line to find truly monster-sized fish while globetrotting through Germany, Australia, Brazil and even the state of Texas. His weekly quest catapults him in search of such fascinating creatures as piranha, alligator gar, wels catfish, bullshark, piraiba/candiru, and arapaima, all supposedly deadly creatures shrouded with mystery — especially their feeding habits. RIVER MONSTERS is a wild journey through the dark side of nature mixing action and adventure with mystery and a battle of wills between man and the almost supernatural beasts that lurk in our serpentine waterways. Wade uses his vast knowledge of fish to try and capture these creatures, and if he can, shows viewers aspects of their anatomy, like jagged teeth or mammoth gills, that make them deadly when they grow to gargantuan girth or multiply in large quantities. With his extreme tactics, vast knowledge, expertise, sheer will and quench to get to the truth of legend, Jeremy tests the waters in each risky and shocking episode in which he may or may not face these predators. The images are intense, immediate, gritty and bone-chilling. During RIVER MONSTERS, Wade investigates and clarifies the scientific facts about each underwater species. More than capable of power and aggression, Wade discovers that the freshwater horrors can truly swallow a human whole, and they are not just the stuff of legends. And while diving, not only does he find the truth behind each mystery, he comes dangerously close to becoming part of the story itself by just barely escaping peril in his encounters. 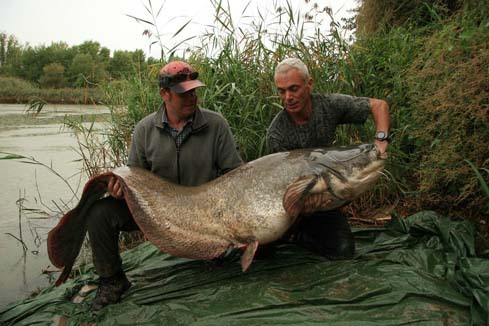 RIVER MONSTERS is a production of Icon Films for Animal Planet. Harry Marshall is the executive producer for Icon Films, and Mick Kaczorowski is the executive producer for Animal Planet. Wade travels to Germany where he meets victims of a beast that has been raising its snout above the surface of freshwaters in Europe for the past 700 years. We discover that the Wels catfish is an aggressive predator of man eating proportions.